Let's do a study about Trains! Want to do a unit study on trains? Look no further! This 90 page download has everything you need! Not a Download Club member? Download on TeachersPayTeachers! Rubber People? MesoAmerican ballgame? What are those? Another civilization appeared in southern Mexico around the same time as the Maya. This civilization is known as the Olmec and they settled on the coast of the Gulf of Mexico (in the current states of Veracruz and Tabasco) directly north of where the Maya lived. No one knows what the Olmec called themselves. The name Olmec comes the Aztec language and means "rubber people." They were given this name due to their mastery of the use of rubber. The first real evidence that we have for the early stages of the Olmec culture comes from a bog called El Manat� in the state of Veracruz, Mexico. The Olmecs used this site from approximately 1600 B.C. until 1200 B.C. Archaeologists have discovered some interesting objects in this bog including wooden sculptures, ceremonial weapons, rubber balls, and babies' bones. No one knows how the babies died, but each set of bones has its own wooden sculpture. The wooden sculptures are busts (the torso, shoulders, and head of a human figure). Most of the the wooden busts were wrapped before being buried. Each one had an individual facial expression and each one was buried with different objects. Also found in the bog were rubber balls buried together with axes, pottery, knives, beads, and more. These objects were carefully placed in specific patterns and not just thrown in a pile. The rubber balls were formed by taking natural rubber and changing its chemical makeup in a process called vulcanization. This process causes the rubber to be less sticky and hold its shape. The discovery of these rubber balls caused archaeologists to consider the Olmec as possible creators of the Mesoamerican ballgame. This ballgame was very popular among later cultures in that region. No one knows the exact rules, but the general idea seemed to be keeping a rubber ball in play by hitting it against a high wall with one's hip. This game was, of course, played for fun sometimes. However, given the elaborate ballcourts that were built, it is highly likely that the game had some ceremonial function as well. 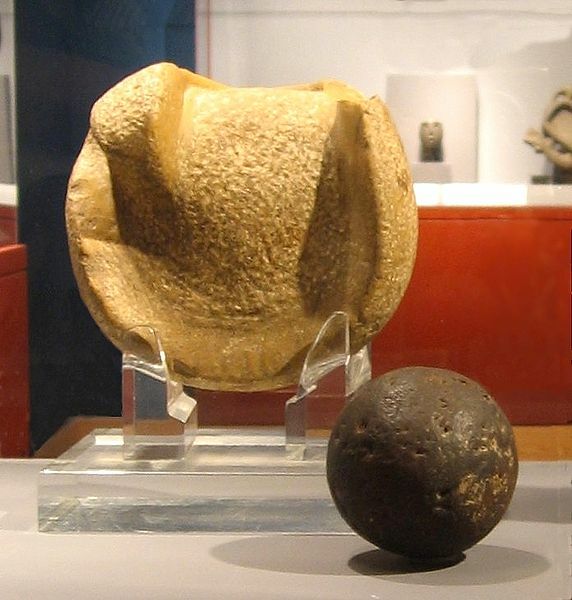 A solid rubber ball used or similar to those used in the Mesoamerican ballgame, from Kaminaljuyu, 300 BC to 250 AD.With a manopla, or handstone, used to strike the ball, also from Kaminaljuyu, 900 BC to 250 AD.The ball is 3 inches (almost 8 cm) in diameter, a size that suggests it was used to play a hand ball. A mitten-shaped space has been carved out for the player's hand. The handstone was probably strapped in place. The far side of the stone is worn nearly smooth where it struck the ball, putting spin on it. Traces of rubber still adhere to the surface.